I found how to add a background color and background image to Rin Editor. The first are the styles for the source, the BBCode editor, the second are the styles for the WYSIWYG editor. You can put a background color adding "background-color: #COLOR;" replacing "COLOR" by the color code, and/or add an image adding "background-image: url(IMAGEURL);" replacing "IMAGEURL" by the url of your background pic. I have added also some "!important" values to assure that anything change my background, but probably are not needed. I would like make it transparent directly, but if I put "background-color: transparent" always is white, also using "!important", I will investigate how to make it transparent directly, but if you have some image as background in your forum or some color different to white or black this is a good way to make it very similar to transparent, probably nobody will notice that this is a textarea with a image background instead of a transparent textarea. Remember add the same code in the rest of css styles for different navigators like gecko and IE, but only editing editor.css will include most of navigators. Is needed remove "youtube" in the plugins list and will disappear. 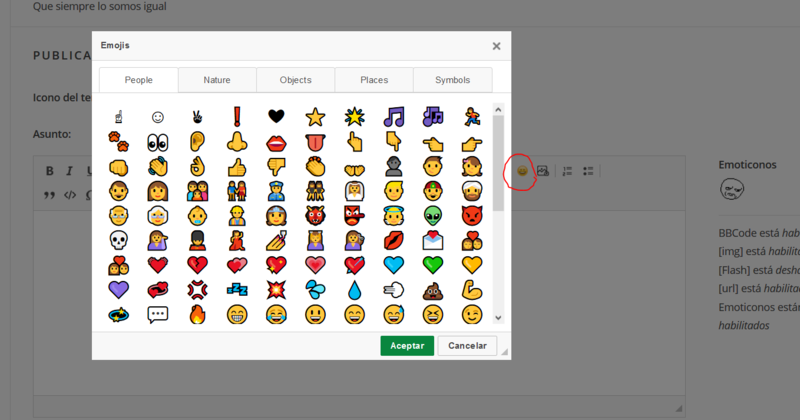 I did it with "smiley" because as you say the smilies are too high and anyway they appear in the right so is not needed this button, so I removed it and I only keep the emojis button that is "emojione" plugin, so I recommend you remove "youtube" and "smiley". This is the problem, I think same than you, I checked a lot of css files and I not got change the size displayed in these big smilies. So one option is remove the button, because is not needed, the smilies already appear in the right. The problem that I had doing it is that I have a problem in the editor, at least using iOS mobile device, when I try to select a text the keypad disappears and some people said me that the editor is not working well, so I needed put the smiley button again. Also when I put a pic background in the wysiwyg editor appears the same problem, appears in both cases, so the best I got without any bug is put a background color seemed to my background pic. So if you want try it check if the WYSIWYG editor works correctly, the best is copy the file and duplicate, then edit, if not works delete and be back to previous version. you can try these css adding it on the content.css or try to find the same info because I not remember where it was, probably was 1 or 2 months ago, probably this will solve the problem. you're welcome, which is the exact css that you used? for if someone more has the same problem. 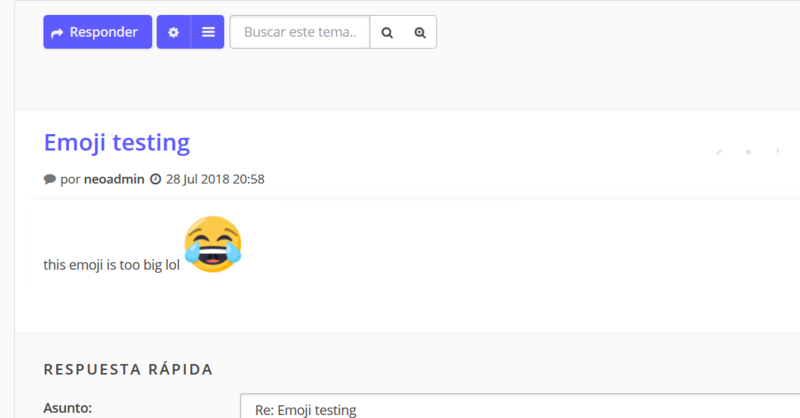 I had the problem that I added smileys by the forum in 250x250 size for better quality, but when I add them in WYSIWYG editor appears the full version instead of 20x20, in the message appears correctly but in the editor the big version so is annoying for people who use the WYSIWYG editor and I needed be back to smileys 20x20. I thought the css was the solution but not worked, only works in the topic view, not in the WYSIWYG editor, so I need continue investigating if is possible view them at max width 20px. Also you can use max-height if you want, instead of max-width, because the height is the problem in the messages, the width is less important. If all emojis have same width and height then is the same, but if some of them have more width than height then maybe is a little ugly the smiley, like a line smiley, but usually most have the same sizes. the change becomes when i deleted the .smilies class. i suppose that there are interferences between smilies and emoji so you have to put the same in both classes. and, if possible, how to add google fonts in the editor? There is possible change the background color also. The background pic has some problems with the WYSIWYG eortor. To edit the BBCode view editor is inside your style (monocolor or monolisa) and then in editor.css there is a large css, find textarea.cke_source and put the font and color you want, also here is possible change the background color or put a background pic.